I love asparagus and I love brie. So why not combine the two? The mustiness if the brie combines very well with the vegetal nature of the asparagus and while this soup seems like it would be very rich… it is. But so worth it. 1. Saute the asparagus in a saucepan with the butter until tender. Stir in the flour and mix until the flour absorbs the liquid. Cook the flour for about 2 minutes or until golden brown, forming a roux. Add the broth slowly, then add cream and wine. Bring to a slow boil and reduce the heat, simmering for 10-15 minutes. 2. 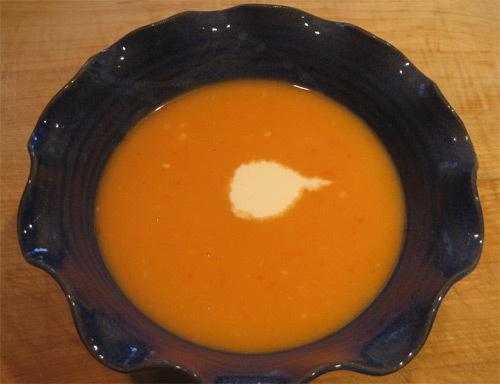 Blend the soup with a hand blender, or in small batches in a food processor. Return to soup the pan and add brie, stirring gently. Simmer at a low heat, uncovered, for 5 minutes or until cheese is melted. This soup is very easy to make in just a few minutes. It is the classic tale of looking in the refrigerator and finding no food. What I did find was a red bell pepper, and a few hunks of cheese. The old potato in the wire basket made the dish almost complete. 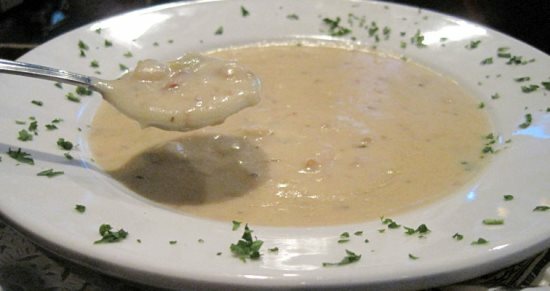 The cheese and the potato give this soup a creamy consistency which is really amazing. The sweetness and distinct flavor of the pepper really come through, even with the intensity of the cheese. You can also use low fat versions of the cheeses with great results. Sometimes I add a chile pepper to give it a nice kick, and pepper jack cheese would do the trick as well. I will also generally use whatever cheese I have on hand, the choice is yours. One really nice aspect of this soup is that by adding the shredded cheese and incorporating it into the hot soup off the heat, most of the cheese melts in, however you will still find cheese strands throughout the soup, giving it a really wonderful combination of textures. 1. Cut the pepper and potato into small pieces and place in a pot with the stock, cooking it at a medium-high heat. 2. After 10 minutes or so, use a hand blender to puree the soup (this can be done by pouring it into a blender as well if you don’t have the hand version). 3. Turn off the heat and add the cheese, stirring to melt it thoroughly. When the cheese has melted, which takes a minute or so, you are ready to serve. This is without question the best version of onion soup that I have ever tasted. 1. Chop and saute yellow onions in butter until translucent. 2. Add salt (to taste) and sugar to onions and mix. 3. Add beef stock, water, red wine, and gin. Bring to a boil and simmer 20 minutes. Turn off stove and let stand 1 hour or more. Ladle into bowls, cover with thin slice of toasted French bread. Cover that with lots and lots of Gruyere (or Swiss) cheese. Run under broiler until cheese melts.